Max Kestner will present his new documentary - the freewheeling BAD CIRCUMSTANCES - at the upcoming CPH:DOX in March 2018. The festival has picked Kestner's film to be one of 10 films representing the best of current Nordic documentaries in the festival's NORDIC:DOX AWARD competition. Kestner is considered to be one of Denmark's most significant and personal voices within the artistic documentary tradition. BAD CIRCUMSTANCES is the result of Kestner's exploration of new working methods. Rejecting the expectations to produce yet another "film that aims to be smart" Kestner entered an unorthodox collaboration with a bunch of experienced team mates - film editor Nanna Frank Møller, graphic designer Torsten Høgh Rasmussen, sound designer Peter Albrechtsen, composer Flemming Nordkrog, colourist Anders V. Christensen and producer Henrik Veileborg. Kestner's message was clear: Let's put aside conventional procedures and start working from a poetic ground zero. BAD CIRCUMSTANCES will premiere at the Grand Theatre Friday March 16 followed by two more screenings during the festival. 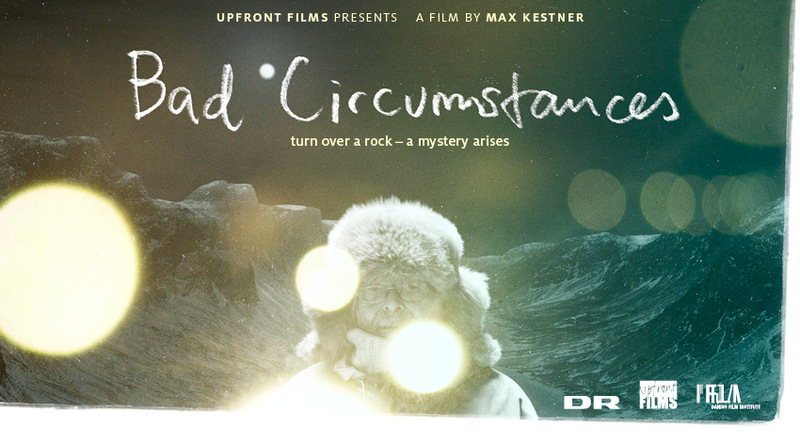 BAD CIRCUMSTANCES is produced by Upfront Films in collaboration with DR and supported by the Danish Film Institute.